HSP is a right wing party (right here and "rights" in the name have no connection, though), follower of the party of the same name founded in 1861 and being the oldest Croatian political party. HSP, virtually disbanded in 1941, was refounded on 25 February 1990 in Zagreb (several parties, or fractions, also claimed the name and inheritance of the old party). While this right winged party drasticaly changed its image, lately showing itself as an European neo-conservative party, in the 1990s, it was flirting with the Ustaša symbolic and ideology. In the 1990-2000s, HSP obtained 3-7 seats in the Parliament. The flag of HSP is prescribed in the party's statutes (text) as a Croatian tricolor flag with the party's emblem in the middle. 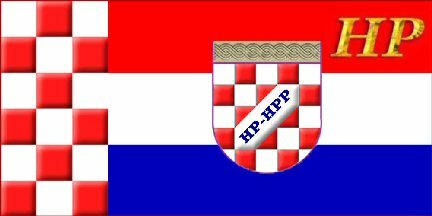 The flag of HSP is to be seen hoisted on their headquarters in Zagreb and in some other of their offices around the town. The emblem of HSP consists of a shield divided by a white bend sinister with the black letters "HSP", the upper field being checky red and white and the lower field blue. The shield is topped with a triple wattle ornament. In the long history of this party, the emblem was sligtly changed occasionally, using golden initials and wattle and other smaller differences. When reestablished in 1990, the party readopted its old flag. Different fractions and other parties claiming the same name (or similar one, adding differenciating attribute - see for instance HSP 1861) use similar flags with minor differences. HSP 1861 was established on 31 May 1995 in Zagreb as a splinter of HSP. The party had 1 seat in the Parliament in 1992-1995. The flag of HSP 1861 is similar to the flag of HSP, with the addition of "1861", the year of establishment of the original HSP. The flag has been reported with slight variations in the design (golden color for the inscription and the wattle). A photo published in 1996 in the regional journal Glas Podravine shows a session of HPS 1861 - displaying the party flag and the unofficial flag of Croatia with a simple checky shield smaller than the white stripe of the flag and starting with the white square, as it was customarly used by right-oriented parties in the second half of the 1990s. HČSP (Hrvatska čista stranka prava was established on 12 December 1992 in Zagreb. The party is extreme-right nationalist. The flag of HČSP is prominently displayed in the party's headquarteres, at least in Zagreb, Frankopanska Street. In Split, the headquarters are in the old town with protected architectural heritage, so that the display of the flag and other party's propaganda, like posters of General Gotovina, is contraversioal. The flag is white with the party's emblem in the middle. The emblem consists of a shield divided per bend sinister, the first checky argent and gules and the second blue with a silver wattle overall. The shield is bordered in gold and topped in red; above it are the black letters HČSP, the caron over the C represented as a rotated red square. The party's website includes some photos of the flag in use, from the fourth and the sixth party's general assemblies. Unfortunately, no years are given for these events, I believe the 6th was in 2006. On the first photo, two different flags are used - the white one, and a yellow flag with the same emblem and a white ribbon inscribed ZA DOM SPREMNI ("For home - ready! ", the motto of the Independent Croatian State). I believe that the yellow flag was the previous one, used until around 2003-2004, when the white flag begun to be hoisted form the headquarters in Zagreb. The Croatian Righters-Croatian Righter's Movement (Hrvatski Pravasi - Hrvatski Pravaski Pokret) appeared in 2003, probably as a splinter of HSP. The party flag (image) was once shown on the party's website (that presents now another party called A-HSP). Soon after the begining of the Homeland War, HSP organized paramilitary units called Croatian Defense Forces (Hrvatske Obrambene Snag - HOS). HSP 1861 also claimed to back up HOS. Active both in Croatian and Bosnia and Herzegovina at the begining of the war, HOS was subsequently disbanded, some of the units being included in the regular army. HOS used a black flag with the emblem in the middle, made of a triple-wattle surrounding a checky shield (with the first square white) over a four-sided blue-white triple wattle (similar to the one used as the Ustasha symbol, on the flags of the Independent State of Croatia during the Second World War), above, the letters "HOS", below, the letters "HSP" and the motto "ZA DOM SPREMNI" ("For home - ready! ", also used by the Independent Croatian State). The flag was used with some variations, most notably with a larger symbol and without the circular wreath. Article Zastava 1. samostalne bojne u Arhiv HV, published on 29 June 2001 in Vinkovački list (scan) reports that the volunteer association of HOS local chapter of the Vukovar-Srijem County decided to deposit the flag of the 1st Independent Battalion of HOS to the "Archives of the Croatia Army". Probably the Central Military Archives of the Ministry of Defence is meant. Whether it was really deposited there, I do not know. It would be more reasonable to put in in the Military Museum, also part of the Ministry, however, I have not found it in the Museum when I searched for flags there. That, of course, does not mean it is, actually, not in the Museum, or possibly indeed it is stored away somewhere in the Archives. The article further recounts that the flag had been consecrated in the Catholic Church in Mirkovci.